Our range of products include pharmaceutical purified water treatment plant and purified water generation plant. Purified Water (PW) Treatment Plants (RO-EDI Plants) generates High Purity water for pharmaceutical, Biotech, Semiconductor and 'Food & Beverages Industry. Sterinox Purified Water Treatment plants are designed and optimised for hassle free low maintenance operation. The entire system utilises best instruments and equipments ensuring solid performance and reliability. Sterinox Purified Water Treatment Plants are skid based and designed to accommodate in minimum footprint. Purified Water Treatment Plants ( RO-EDI Plants) generates high Purity water for Pharmaceutical, Biotech, Semiconductor and Food & Beverages Industry. Sterinox Purified Water Treatment plant are designed and optimised for hassle free low maintenance Operation. The plants are skid based and designed to accommodate in minimum footprint. Ø The Final output Quality complies with USFDA, MHRA, WHO, EU & Other International Pharmacopeia's and Standard. Ø Plants are manufactured as per cGMP Guidelines and complies with ASME BPE Standard. 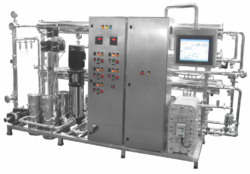 Ø PLC Based fully automated plant complies with 21CFR part 11 & GAMP 5. Ø Designed for minimum dead leg criterion of < 1.5 D. Also 100 % drainability can be achieved by maintaining the minimum Slope of 1: 100. Ø Complete Interconnecting piping is semi seamless tubes as per ASTM A270 and are Orbital welded using high purity (99.99%) argon gas and joints can be inspected by boroscopy machine. Ø Complete set of Documentation and Certificates to ensure compliance with Regulatory Authority. Ø Capacity varies from 50 Litres/Hour to 10,000 Litres/ Hours.